This is a sponsored post written by me on behalf of Personal Creations; all opinions are my own. Hi friends! I know you’re still counting down to Christmas – but you realize that the WEEK AFTER is New Years, right? Eeek! I feel like not only does Thanksgiving get bypassed because of Christmas but New Years Eve is almost always an afterthought. Well not this year! 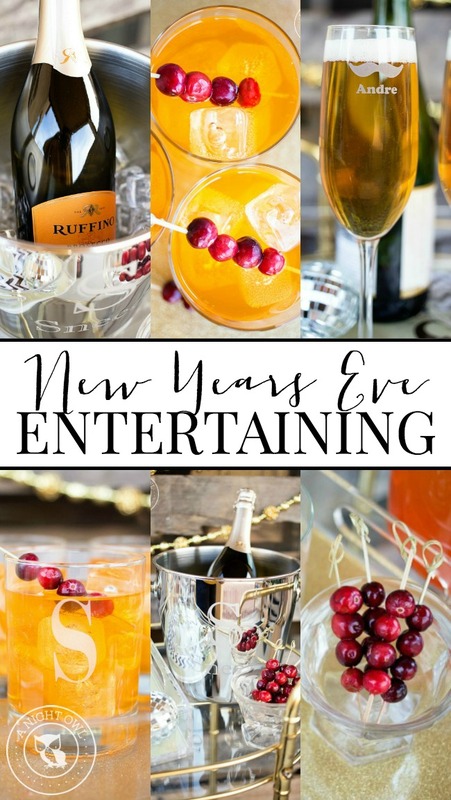 This year I’m going to share some New Years Entertaining tips with Personal Creations! 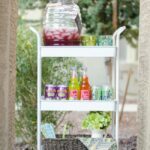 We’re going to share how you can stock your bar cart this year with the best in entertaining products! I just LOVE Personal Creations! If you haven’t shopped there before – what are you waiting for?! For over 10 years, Personal Creations has been helping create lasting memories with perfect, personalized gifts for all of life’s special occasions. And this is the PERFECT time of year to take advantage! On their LONG list of quality items, they have some FANTASTIC entertaining products! 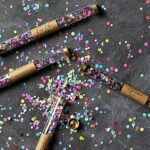 These products are perfect to snag for your New Years party and will be relevant for ALL your party needs throughout the year! 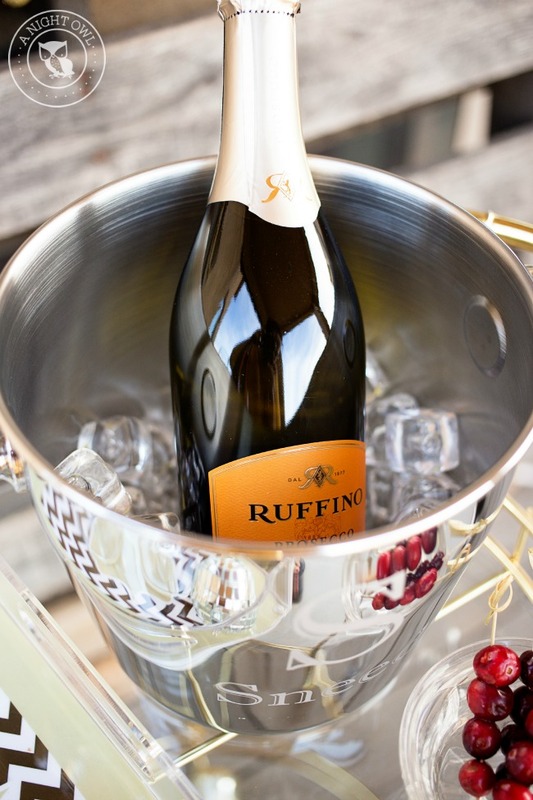 A must for any New Years party is that Champagne Bucket to keep your bubbly on ice! Personal Creations has a few great options, including a wine chiller and monogram ice bucket as well. 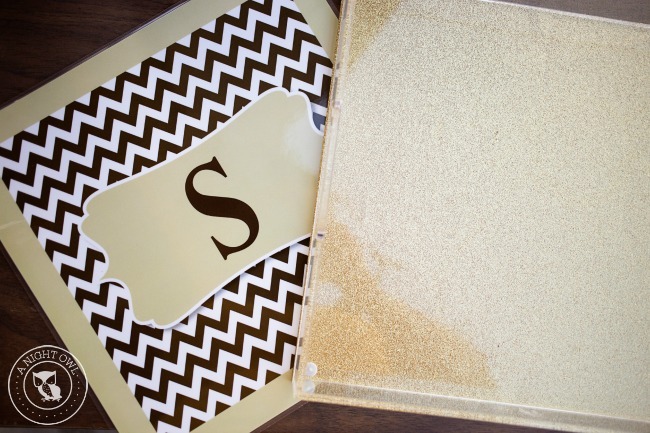 I love that we can monogram and personalize items too – such a nice touch! 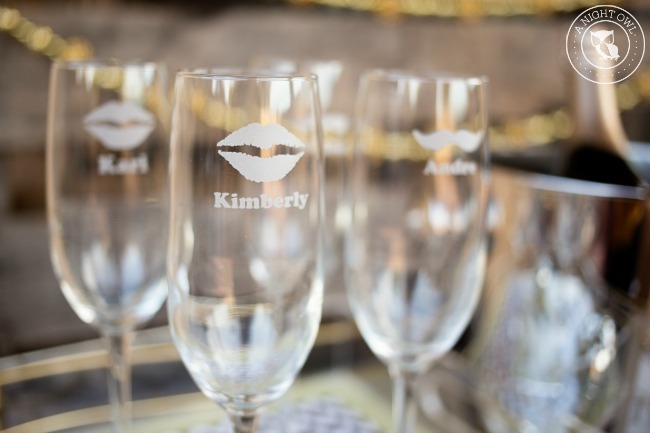 Along with the personalized champagne cooler you can also personalize your champagne glasses! 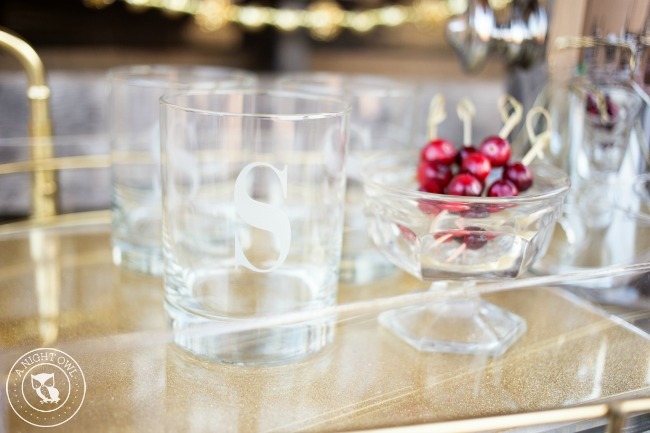 Now these I LOVE because if you know your guest list ahead of time you can even personalize glasses for your guests and have them take the glasses home as a fabulous party favor! I love the Lips & Mustache Champagne Glasses! They are fun and whimsical additions to any party. I should have captured the image of Andre drinking from his champagne glass. Even he had fun with the mustache glass – order them! They’ll be a great conversation piece for your party. 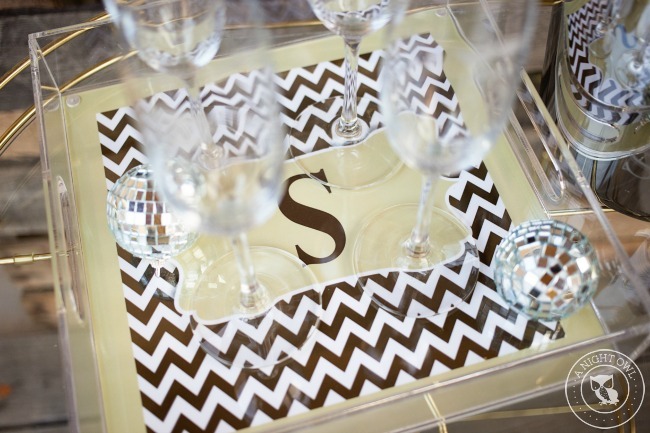 Now that you have your champagne bucket and your glasses, what better to serve them on than this lovely Personalized Acrylic Tray! I have been drooling over these for so long and finally own! What I didn’t know until we received the tray is that you can even swap out the personalized insert for any other 12×12 sized paper! For our New Years Party I thought we could swap it out for maybe a little more glam – GLITTER! And I was right, the glitter just added to the decor. 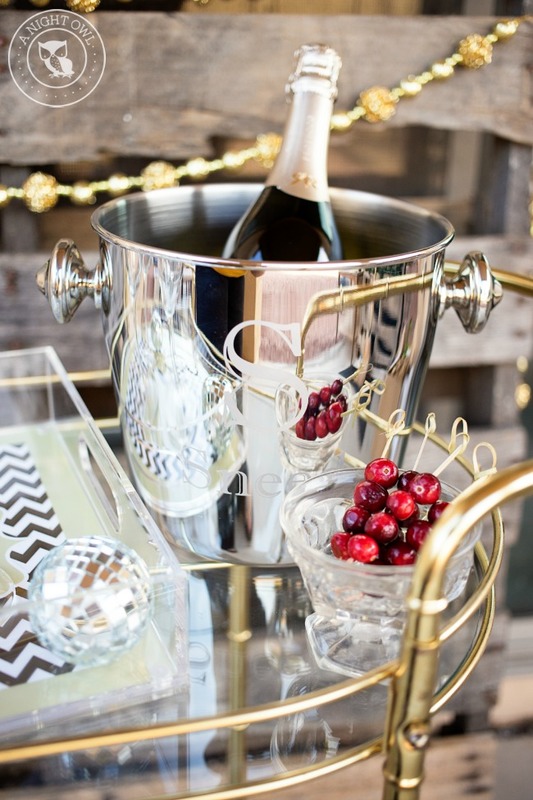 Now your bar cart is well on it’s way to New Years glam! Now on to the drinks. 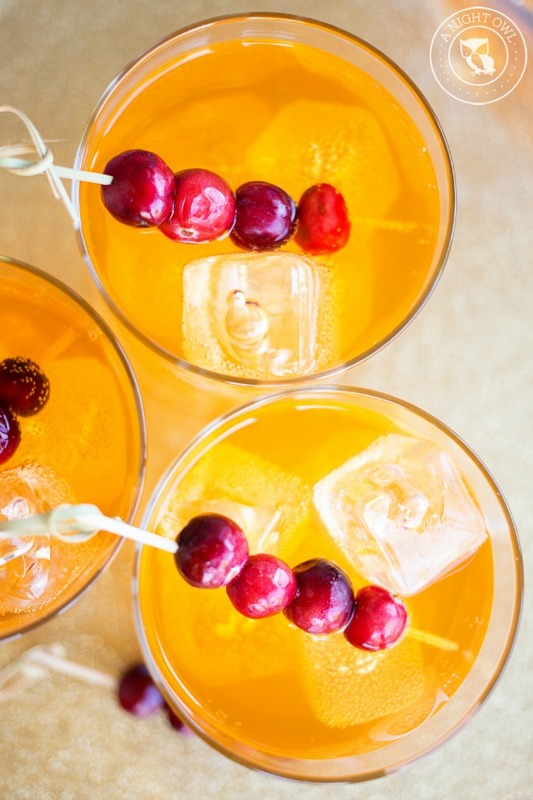 Not just any bubbly drink – whip up a custom concoction for your party! 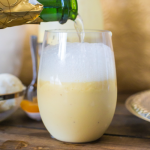 We whipped up some Mexican Sparkling Chimayos, a delicious fizzy tequila drink that trust me, you’re going to want to try. And your special drink should be served up in Personalized Short Glasses. One of our favorite items from Personal Creations is our Mason Jar Set, perfect for drinking! So I knew these short glasses would also be a big hit. 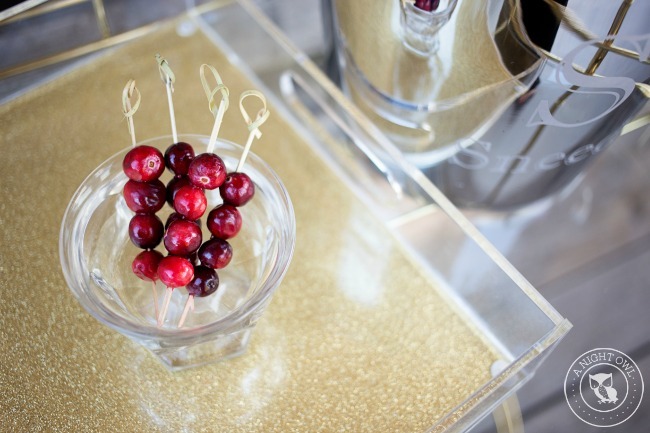 And let me tell you, our Sparkling Chimayos look amazing served up with a little cranberry garnish! So now you’re all set for ALL your New Years Entertaining needs – champagne on ice? Check. 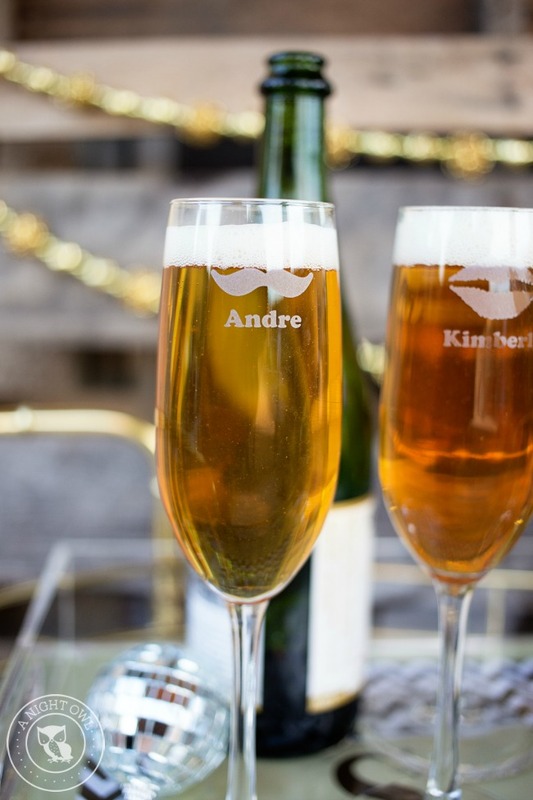 Personalized champagne glasses served on a personalized tray? Check. 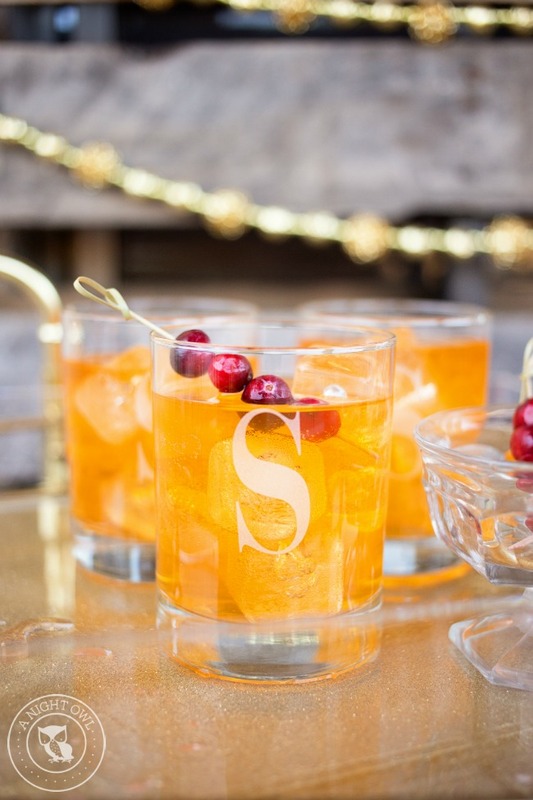 A custom cocktail served in personalized short glasses? Check! 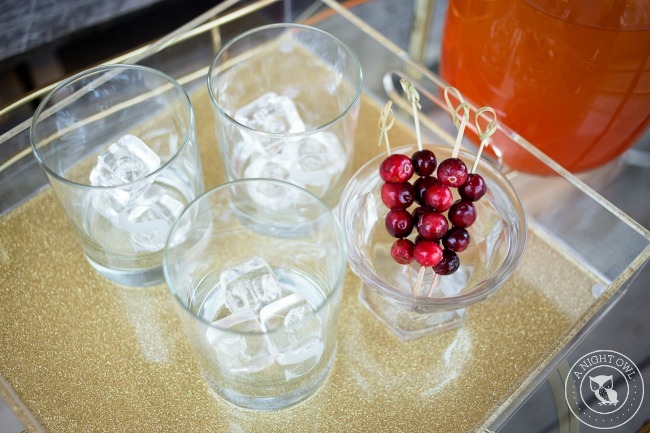 Everything you need to make your bar cart shine! So be sure to GET ON OVER to Personalized Creations today and make your order! Get it in now and you’ll be all set for the New Year! I would get wine glasses. I like the Carved Heart Art Canvas. Always kiss me goodnight pillow cases. I love the mason jar mugs! I’d get a backpack for my son. I’d love to make some holiday artwork for our home like this one: https://gifts.personalcreations.com/gifts/family-christmas-rules-canvas-30147387?ref=pcrsclcampaign_personalizationinspiration&tile=hmpg_hero1&viewpos=1&trackingpgroup=pchrhom So pretty! I love the Lips & Mustache Champagne Glasses! I love beer mugs. I don’t drink beer, however I love drinking out of the heavy glasses. I would create a satin trim blanket as a gift. I love mugs and would choose one of those. I would create the Family Initial Framed Print. I would personalized pie dishes. I would make a personalized baby acrylic photo block. I would create personalized pie dishes for my mom. I would make a personalized reindeer stocking for my daughter. I would create a Family Tree Throw!!! I would get the Snowmen Stick Family Doormat. It’s so cute. The mason jar mugs are my favorite! Love me some personalized wine glasses! I would probably create some photo cards or placemats with people I know. I would get some man cave mugs. I would purchase some personalized Knit Character stockings! Totally love the Heart in Sand Framed Print! I would make my sister a baking pan, she has always wanted one. As a coffee addict and new mom who neglects the dishes on occasion, I would get coffee mugs, lots of coffee mugs, haha! I love to collect mugs and unique wine glasses. I would choose some of those. I would personalize wine glasses. I love the idea of personalized wine glasses…either for myself or a gift for someone special. I would love champagne glasses with my name and my husband’s name and our wedding anniversary date! I would love to create a personalized throw blanket for my mom for the New Year. She would love this on her chair. I would get a poly filled satin trim blanket. My son and daughter-in-law are working on adopting a baby! We are having a new years party, so the champagne glasses would be perfect! I would make a throw blanket with my kid’s picture on it for my Mom. 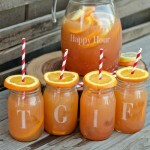 The mason jar jugs is something I would really like! I like the Puzzle Wall Plaque. I love the Carved Heart Art Canvas! I LOVE the mason jars- so I would get those for sure. But I’d also make sure and pick up the Family Tree of Hearts Canvas and the designer Peppermill. Thanks for such a cute and fun giveaway!!! I would love to create some custom beer/pint glasses for my boyfriend. I love the Personalized Acrylic Tray!!! I love the stockings! I would love to get some of those first! I would get all sorts of personalized glassware. From champagne glasses to mason jar mugs. I really like the Family Christmas Rules Canvas. I love the Custom Throw. I would love to get a few of the Dog Memorial Stones for the two dogs that passed away this year. What a great way to memorialize them. I like the Take Along Chair! I would get the Home/Family Coat Rack. thank you!! I like the pretty tray with an initial. So hard to pick!! So many beautiful things!! I would pick the treat jars. I lOVE them! Matching Christmas pajamas for my kids! I would love to get the Name Puzzle Boards – Pastel Colors for my baby girl. They have some really fantastic things to choose from but If I had to choose I’d opt for the Mason Jar Set! I like the personalized mugs and pie plates. I would get the His/Hers Split Heart Keychain for my husband for our anniversary! champagne glasses since we don’t have any. I would make personalized gift tab labels. I would like the personalized mugs! I would love to get personalized mason jars. So many nice looking things I don’t know what to choose! Thinking something for valentine’s day. I’d love the mason jar glasses. totally love the customized wine/champagne glasses! I love the mustache & lips! So cute ! I would love a personalized dormat and also gifts for my sisters wedding! Love those champagne glasses, such a fun idea! I like so many of the things, but I have ordered picture frames from them before and loved them. I would do treat jars. So cool! I like the Galway Irish Crystal Longford Wine Glass Set. So pretty. I would definitely go for the wine glasses. I love the destinations map! 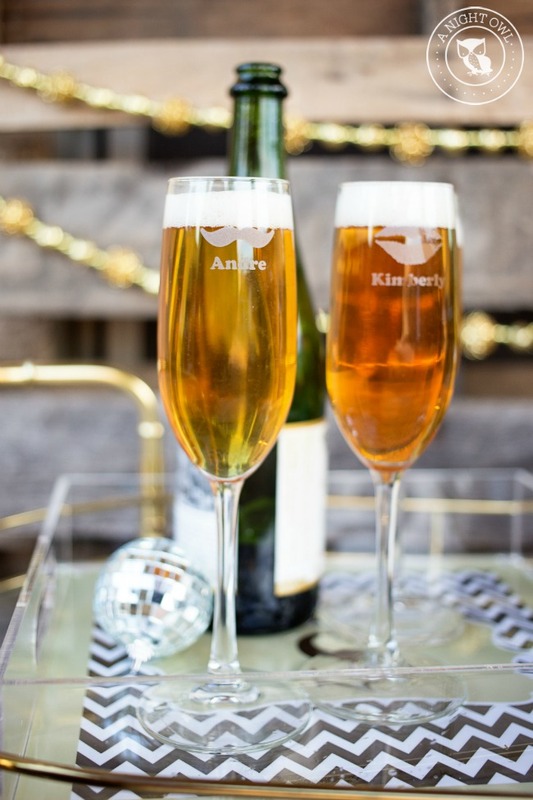 I love the personalized champagne glasses, a wonderful way to start off the New Year! I’d like to get the Designer Peppermills for grillers and cooks in my life. As a wedding planner, I would love to get my clients the State & Date Remember coaster and bottle opener. It would be just a great way to say “thank you for booking us”. I love the personalized tray and the fact that it is so easily changed. Hello! This is such an a neat shop. One item I would definitely get is their personalized plush basketball for my grandson. He would love it! Thank-you!! I would def get the pillowcases & mason jar mugs. Something for me & something for him! I love them all though! I like the galvanized beverage tub. The item that I would create on Personal Creations is a T-shirt. I would love the personalized champagne glasses! I’d get a personalized stuffie and backpack for my daughter. Matching wine glasses for my bff and me. I would like the snowman doormat. I would create Bridal Party Tank Top for my best friends wedding! I would like to create a Graduation Photo Tile for my nephew when he graduates from college this spring. One product I would create would be the Neck of the Woods Doormat. Oh I really love the Stainless Steel Bread Box personalized! That would help get the breads and clutter off our counters! So pretty! I would love to get some champaign glasses made for are anniversary.. I love the personalized glasses. I love the monogrammed champagne flutes! I would get some personalized casserole dishes. I would also get a peppermill for my niece. i really like the ice bucket and the wine glasses, so if i won i would be picking one of those or both !! There are so many great things it is hard to choose. However, I really like the Heart Full of Love treat jar. I would get the Family initial canvas. I would get a cutting board. I would create some personalized stuffies for my kids. I like the Christmas Cheer Mason Jar! My grandson would love the turtle stuffie. I would like a personalized wine glass. My girlfriends and I would love them. I’d personalize the Galvanized Beverage Tub for our barbecues and get the personalized dog doormat. I would make the Heart in Sand Framed Print for myself and one for my daughter that just got married. I would try the Mosaic Flower Pots !!! A throw blanket would be nice. Heart in Sand Framed Print is awesome! I really like the Family Tree of Hearts Canvas. The Family Friendly Characters Treat Jar would be perfect for our house. I would create Argyle Pet Bowls and Placemats. I can never have enough mugs so I would love to create a personalized mug or two! I would definitely do a couple personalized mugs! I love the good night pillow cases. I would create a Guitar Lounge Sign for my husband and a Personalized Fishing Pail for my Dad. I think I would go with a family photo throw to hand down to my daughters. I like the Puzzle Name Stools. I love the etched personalized wine glasses. I’d love to get some made for all my best friends. I would get Christmas ornaments and probably the mason jars. It’s hard to choose. So much cute stuff! I’d have to start with the WEEKENDER BAG and the SOCK MONKEY CUDDLY COMPANION for both of my grandsons! I love the “What a Difference a Day Makes Canvas”. I would like to make a frame for my sister and her family of the kids names. I would make some personalized champagne flutes. I like the Locker Room Prints in the Saints. I really like the Kidkraft Austin Toy Box for my daughter.